Before Britain went metric in 1972, British Imperial measurements were based on man and the harmonies of the earth. An inch was the length of the first joint of a man’s thumb. A foot was - you guessed it - the length of his foot. The ell and the cubit - from fingertip to elbow. The yard - from nose to fingertips. 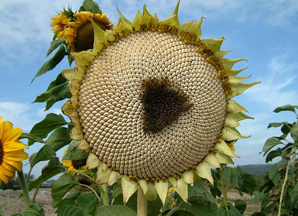 Spirals are nature’s most repeated pattern - the seeds in a sunflower, nebulae in outer space, storms and hurricanes, whirlpools, sea shells, the nautilus and ammonites to name but a few. 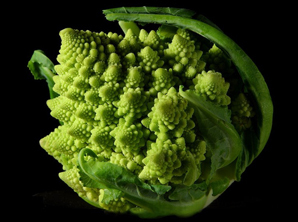 She introduced us to fractals, the way nature reproduces itself, increasing or decreasing but always to scale, as in snowflakes, a beautiful fern or the amazing Romanesco cauliflower. Which lead us to the involute curve that gives us the eagle’s beak, the dorsal fin of a shark, a sheep’s horns. Similarly, triangles and the power of three are to be found everywhere too. In pyramids, in folklore - witness Goldilocks and the three bears, three blind mice, everyone always gets three wishes. The equilateral triangle, which has three angles of 60 degrees, is geometry’s most stable structure. Touching lightly on the boring bits - there are only seven basic structures of crystals; the five platonic solids form all other matter, plus ether, Trish used on-screen charts and diagrams to initiate us into the mysteries of the Fibonacci series and spirals governed by Phi, the Greek letter that represents 1:1.618, the Golden Ratio. Not forgetting the vesica piscis formed by two overlapping circles and held very sacred by most religions. 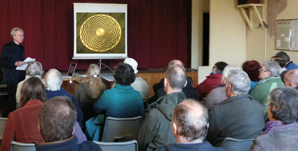 We saw how sacred geometry also pops up in architecture and art, adopted by the medieval church in the middle ages. It brought harmony in design and composition, and we were asked which we thought had the most sacred geometry, the Royal Crescent in Bath or the Tricorn Centre in Stroud? Sacred Geometry is everywhere you look, and there is little doubt that when early man was building Stonehenge, and the Egyptians were erecting the pyramids, they knew and understood all about sacred geometry. Our next meeting is Thursday 12th February, Lorraine Doherty on the Bosnian Pyramids.